If you’re new to AYLIEN and don’t yet have an account you can take a look at our blog on getting started with the API or alternatively you can go directly to the getting started page on our website which will take you through the signup process. We provide a free plan which allows you to make up to 1,000 calls per day to the API for free forever. All of our SDK repositories are hosted on Github. To use the SDK start by making the following addition to your composer.json. Once you’ve installed the SDK you’re ready to start coding! For the remainder of this blog we’ll walk you through making calls using the PHP SDK and show the output you should receive in each case while showcasing a few simple features of the API. Once you’ve subscribed to our API and have downloaded the SDK you can start making calls by adding the following PHP code. 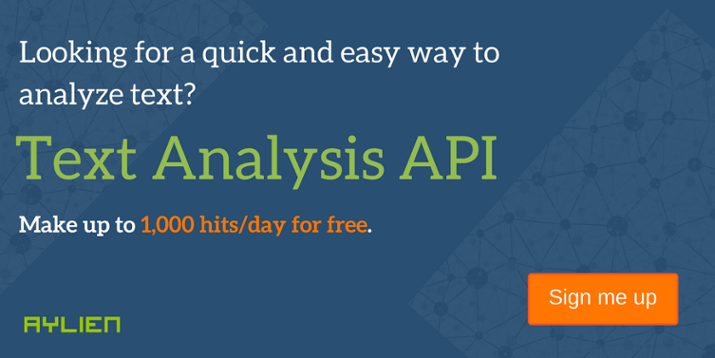 When calling the API you can pass a piece of text directly to the API for analysis or you can pass a URL and we will automatically extract the main piece of text on that webpage. You can call the endpoint using the following piece of code. You should receive an output similar to the one shown below which shows that the language detected was English and the confidence that it was detected correctly (a number between 0 and 1) is very close to 1 indicating that you can be pretty sure it is correct. Text: What language is this sentence written in? Text: John is a very good football player! Now we’re going to take a look at our Classification endpoint. The Classification endpoint automatically assigns an article or piece of text to one or more categories making it easier to manage and sort. The classification is based on IPTC International Subject News Codes and can identify up to 500 categories. The code below analyses a BBC news article about how animals eveolved on earth. When you run this code you should receive an output similar to that shown below which assigns the article an IPTC label of “natural science – geology” with an IPTC code of 13004001. Next, we’ll look at analyzing the same BBC article to extract hashtag suggestions for sharing the article on social media with the following code. If your more of a node of Java fan, check out the rest of our SDKs for node.js, Go, Ruby, Python, Java and .Net (C#). For more information regarding the APIs go to the documentation section of our website. We’re publishing ‘getting started’ blogs for the remaining SDKs over the coming weeks so keep an eye out for them.